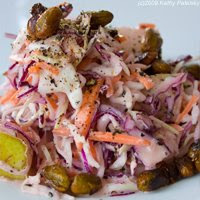 Munch on some crunchy cabbage with my sweet and zesty Vegan Cole Slaw recipe. 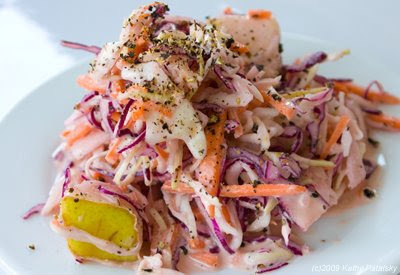 I love cole slaw and this refreshingly light, yet creamy, recipe really hits the spot. Plus, add some honey-toasted pistachios for extra crunch - and nutrition! Healthy crunch. 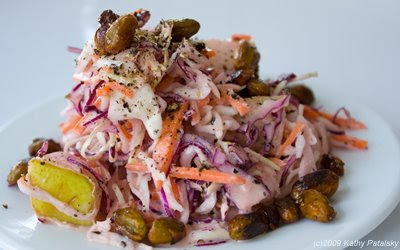 Carrots rich in vitamin A. Cabbage rich in fiber and vitamin K, A and C. Uses zesty Veganaise, vegan "mayo" - so no unhealthy saturated fat-loaded mayo. I've even added a few twists on this classic dish. Add agave and some black pepper.